Squire Joseph Mitton is the axiom ancestor to all the previous male line Mittons back to Ralph the Red. Joseph Mitton`s descendent’s began the first of the Canadian immigrations. There are many extended Mitton families from those generations to Canada and the US. In each of these genealogies cited there are some mistakes, including dates, wives names, etc. As an example “Squire” Joseph was not born in 1689. That was his grandfather by the same name. “Squire” Joseph “Squire” Mitton was born Nov. 11, 1723, Kettle-well, Yorkshire. Married, Dec. 15, 1750 (age 27) to Mary Wilkinson. Died Nov. 25, 1792 and buried at Horton in Ribblesdale. The 1906 primary document hand written by Edmund D. Mitton of Ridgetown, Ontario describes where his ancestors came from in England. He starts with his great, great, grandfather Joseph “Squire” Mitton born in 1723 in Starbotton and (we think but his son is for sure) buried in Horton-in-Ribblesdale 1792. Joseph Mitton had a farm called Ribblesdale in Yorkshire, only about 22 miles north of Great Mitton. 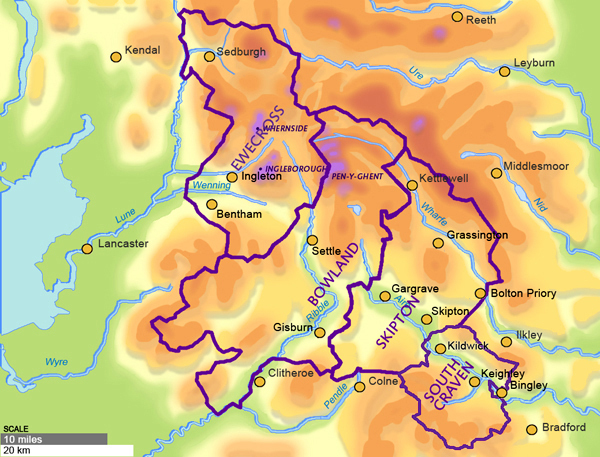 All the other Mittons prior to “Squire” Joseph Mitton in Yorkshire have geographic genealogy that is from this same Craven area. (That is why Jack Knowles’ 1982 genealogy is called “The Mittons of Craven”). It does not appear the Mittons went more than 25-50 miles in 700 years from where they first established themselves at “Mitune” near Clitheroe at the beginning of the 12th century – not unusual for those centuries as moving about is a rather new phenomenon. So the close geography of the Norman de Mittons to “Squire” Joseph Mittons farm in the Craven area of Yorkshire is strong evidence of a similar bloodlines. The family descendants did not move much if at all from these areas over the centuries which helps to substantiate the ancestry. The conclusions of those who have researched this genealogy before my efforts are of similar results and to which I have relied on and hopefully added to with this effort. 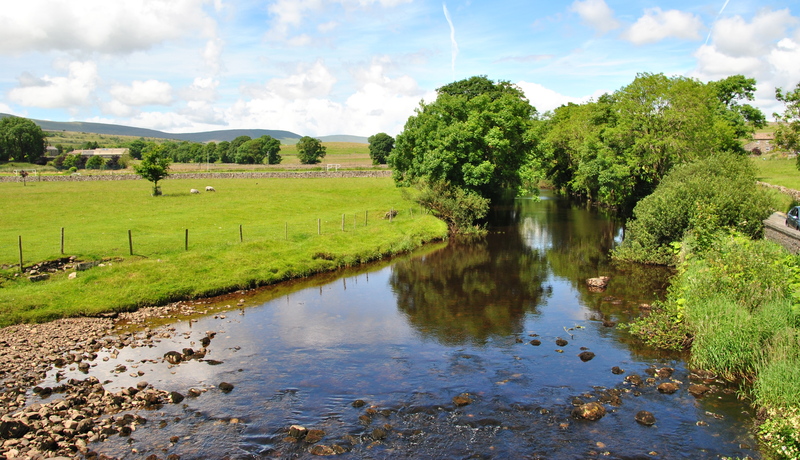 This photo left is of the Ribble at the heart of Horton in Ribblesdale. ‘Squire’ Joseph Mitton had a farm in Ribblesdale between two rivers. This is a farm similar to the one described by Edmund D. Mitton. 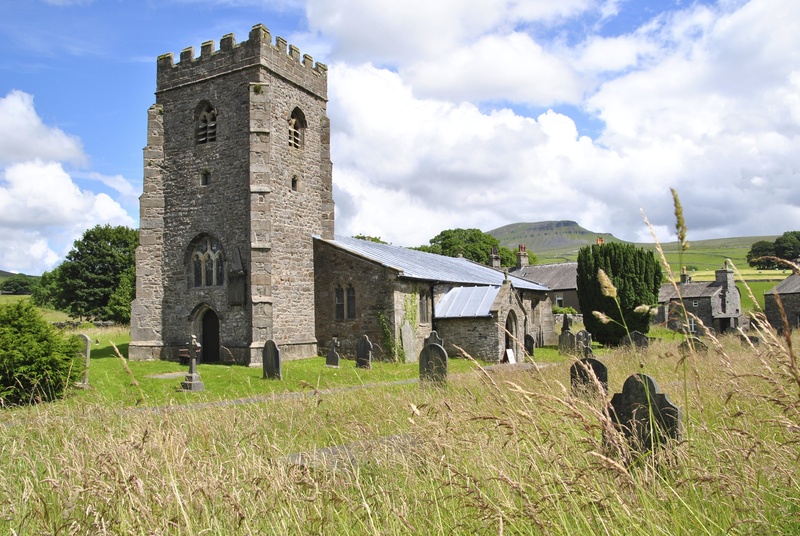 Below left is the church of St. Oswald at Horton-in-Ribblesdale where ‘Squire’ Joseph Mitton (1723 to 1792) of Horton is buried in the churchyard. His son also named Joseph is buried their with the tombstone just to the right of the screen in the below left photo. The church is also where his great grandson John Mitton, later known as “Grover John” of Howard Township, Canada was baptized on Aug. 9, 1818. His parents immediately emigrated that year for Canada. The above left is St Oswald’s church at Horton in Ribblesdale. The “de Mittons” from Great Mitton seemed to have migrated to the Craven area after the lands they had possessed since 1102 when Thomas Plantagent suceeded Henry de Lacy and were later confiscated by King Edward II following the rebellion and execution of Thomas in 1322, Earl of Lancaster who had married Alice de Lacy, the only surviving heir of Henry de Lacy (2). The first record of a Mitton in Craven is the death of Roger Mitton of Austwick who died in 1585. According to Jack Knowles The Mittons of Craven 1982, he was probably the father of Richard, married to Elizabeth. The research by Jack Knowles is very exhaustive and extensive genealogy, albeit with a number of mistakes. It addresses the 14th to 15th century “Mitton gap” and speculates on the paternal line connections to the Norman Mittons in the centuries after the Conquest. Finally there is the family tree of the Ontario Mittons that can be found on that mwebsite and is an excellent way to find if you are a descendant of “Squire” Joseph Mitton. It was “Squire” Joseph Mittons sons and grandsons that began the Mitton immigrations to Canada at different subsequent dates. If you are a Canadian or US Mitton and can trace your lineage back to “Squire Joseph” than you are also a descendant of Ralph the Red. JOSEPH6 MITTON (ROBERT5, JOSEPH4, ROBERT3, RICHARD2 MITTON?, ROGER1)2 was born Abt. 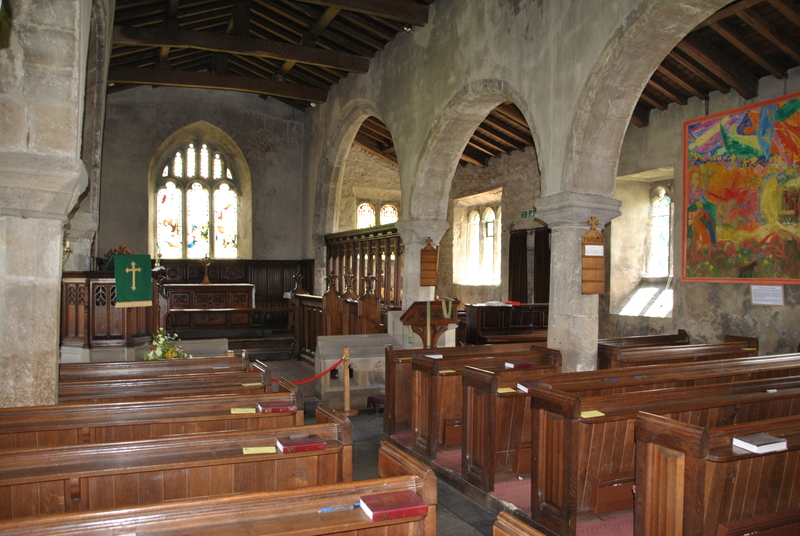 1723 in Starbotton, Kettlewell, Lancashire, England, and died Abt. November 25, 1792 in Horton-in-Ribblesdale, Yorkshire, England. He married MARY WILKINSON2 December 15, 17503, daughter of HENRY WILKINSON and ELIZABETH TENNANT. She was born Abt. 1728 in Beecroft, Horton-in-Ribblesdale, Yorkshire, England, and died Abt. 1809 in Horton-in-Ribblesdale, Yorkshire, England. Joseph was a farmer in Starbotton 1751-57, Yockenthwaite 1759, Walden 1726-65, Bentham and Newhouse (Horton). He was known as “Squire”. He was buried Nov 25, 1792. 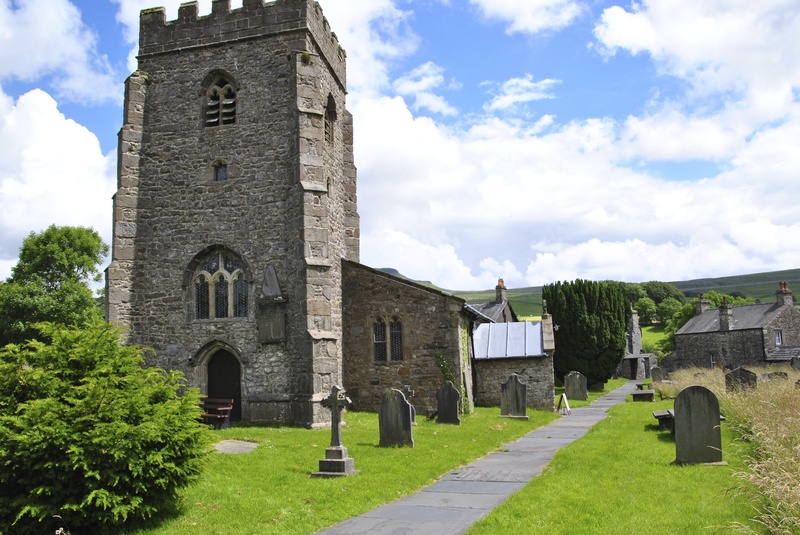 Burial: We believe buried at St. Oswald’s, Horton-In-Ribblesdale, Yorkshire, England. However the author was only able to find the grave site of his son also named Joseph Mitton directly to the right of the church below. This was confirmed by Niall McMahon (Mitton) the authors 5th cousin in 2017 whose 4th great grandfather was that Joseph Mitton the son of “Squire” Joseph Mitton 1723-92. Horton-in-Ribblesdale was historically a part of Ewcross wapentake in the West Riding of Yorkshire. It became a parish town in the early 12th century when the church of St. Oswald was established. This church was historically associated with the Deanery of Chester, and was part of the Diocese of York – though, today it is part of the Diocese of Bradford. The surviving parish records date back to 1556. In the 13th century the village and parish were ruled by rival monastic orders at Jervaulx Abbey and Fountains Abbey. Their dispute stemmed from a 1220 transfer of property here by William de Mowbray to the Fountains monks, which challenged the primacy of an earlier grant by Henry III to Jervaulx’s predecessors at Fors Abbey. Not until 1315 was this dispute firmly settled, when Edward II confirmed the Abbot of Jervaulx as Lord of Horton-in-Ribblesdale. During the Dissolution of the Monasteries, the monks’ interest at Horton-in-Ribblesdale was attributed with an annual income of £32 and 5 shillings; and was given to the Earl of Lennox. He, in turn, disposed of the manor lands about 1569 or 1570 to a syndicate consisting of John Lennard, Ralph Scrope, Ralph Rokebie, Sampson Lennard, William Forest, Robert Cloughe and Henry Dyxon. It seems the manor lands were eventually held solely by the family of John Lennard, the first named member of the syndicate. His daughter Lady Anne Lennard married Sir Leonard Bosville of Bradburne in Kent and together they sold their interests at Horton-in-Ribblesdale during the reign of Charles II to a partnership consisting of Lawrence Burton, Richard Wigglesworth and Francis Howson. In 1597 Horton in Ribblesdale, like so much of northern England, was struck by a killer plague. This is confirmed by the parish burial register, which lists 74 deaths that year compared to just 17 deaths during the preceding and succeeding years. Those lost to this pandemic amounted to roughly one-eighth of the parish’s population. In 1725, local squire John Armistead left an endowment to establish a free grammar school here.